The Extensible Markup Language (XML) has become a popular method of describing data. As more bundles use XML to describe their data, a common XML Parser becomes necessary in an embedded environment in order to reduce the need for space. Not all XML Parsers are equivalent in function, however, and not all bundles have the same requirements on an XML parser. XMLParserActivator - A utility class that registers a parser factory from declarative information in the Manifest file. SAXParserFactory - A class that can create an instance of a SAXParser class. DocumentBuilderFactory - A class that can create an instance of a DocumentBuilder class. SAXParser - A parser, instantiated by a SaxParserFactory object, that parses according to the SAX specifications. DocumentBuilder - A parser, instantiated by a DocumentBuilderFactory, that parses according to the DOM specifications. A bundle containing a SAX or DOM parser is started. This bundle registers a SAXParserFactory and/or a DocumentBuilderFactory service object with the Framework. Service registration properties describe the features of the parsers to other bundles. A bundle that needs an XML parser will get a SAXParserFactory or DocumentBuilderFactory service object from the Framework service registry. This object is then used to instantiate the requested parsers according to their specifications. Both standards, however, define an abstract API that can be implemented by different vendors. A given XML Parser implementation may support either or both of these parser types by implementing the org.w3c.dom and/or org.xml.sax packages. In addition, parsers have characteristics such as whether they are validating or non-validating parsers and whether or not they are name-space aware. An application which uses a specific XML Parser must code to that specific parser and become coupled to that specific implementation. If the parser has implemented  JAXP, however, the application developer can code against SAX or DOM and let the runtime environment decide which parser implementation is used. JAXP uses the concept of a factory. A factory object is an object that abstracts the creation of another object. JAXP defines a DocumentBuilderFactory and a SAXParserFactory class for this purpose. JAXP is implemented in the javax.xml.parsers package and provides an abstraction layer between an application and a specific XML Parser implementation. Using JAXP, applications can choose to use any JAXP compliant parser without changing any code, simply by changing a System property which specifies the SAX- and DOM factory class names. In JAXP, the default factory is obtained with a static method in the SAXParserFactory or DocumentBuilderFactory class. This method will inspect the associated System property and create a new instance of that class. The current specification of JAXP has the limitation that only one of each type of parser factories can be registered. This specification specifies how multiple SAXParserFactory objects and DocumentBuilderFactory objects can be made available to bundles simultaneously. With this functionality, bundles can query the OSGi service registry for parsers supporting the specific functionality that they require. PARSER_NAMESPACEAWARE - The registered parser is aware of name-spaces. Name-spaces allow an XML document to consist of independently developed DTDs. In an XML document, they are recognized by the xmlns attribute and names prefixed with an abbreviated name-space identifier, like: <xsl:if ...>. The type is a Boolean object that must be true when the parser supports name-spaces. All other values, or the absence of the property, indicate that the parser does not implement name-spaces. PARSER_VALIDATING - The registered parser can read the DTD and can validate the XML accordingly. The type is a Boolean object that must true when the parser is validating. All other values, or the absence of the property, indicate that the parser does not validate. Getting a parser factory requires a bundle to get the appropriate factory from the service registry. In a simple case in which a non-validating, non-name-space aware parser would suffice, it is best to use getServiceReference(String). 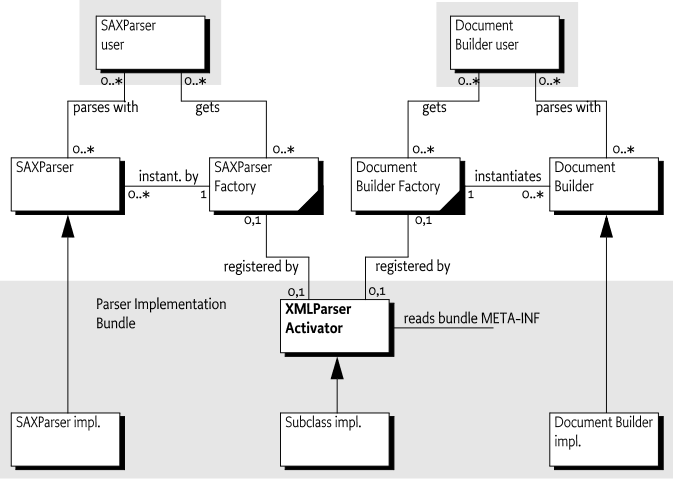 If an XML Parser supports JAXP, then it can be converted to an OSGi aware bundle by adding a BundleActivator class which registers an XML Parser Service. The utility org.osgi.util.xml.XMLParserActivator class provides this function and can be added (copied, not referenced) to any XML Parser bundle, or it can be extended and customized if desired. Its functionality is based on the definition of the  JAR File specification, services directory. This specification defines a concept for service providers. A JAR file can contain an implementation of an abstractly defined service. The class (or classes) implementing the service are designated from a file in the META-INF/services directory. The name of this file is the same as the abstract service class. The content of the UTF-8 encoded file is a list of class names separated by new lines. White space is ignored and the number sign ('#' \u0023) is the comment character. JAXP uses this service provider mechanism. It is therefore likely that vendors will place these service files in the META-INF/services directory. To support this mechanism, the XML Parser service provides a utility class that should be normally delivered with the OSGi framework implementation. This class is a Bundle Activator and must start when the bundle is started. This class is copied into the parser bundle, and not imported. The start method of the utility BundleActivator class will look in the META-INF/services service provider directory for the files javax.xml.parsers.SAXParserFactory ( SAXFACTORYNAME ) or javax.xml.parsers.DocumentBuilderFactory ( DOMFACTORYNAME ). The full path name is specified in the constants SAXCLASSFILE and DOMCLASSFILE respectively. Both the javax.xml.parsers.SAXParserFactory and the javax.xml.parsers.DocumentBuilderFactory provide methods that describe the features of the parsers they can create. The XMLParserActivator activator will use these methods to set the values of the properties, as defined in Properties, that describe the instances. If SAX parsing is supported, create a /META-INF/services/javax.xml.parsers.SAXParserFactory resource file containing the class names of the SAXParserFactory classes. If DOM parsing is supported, create a /META-INF/services/javax.xml.parsers.DocumentBuilderFactory file containing the fully qualified class names of the DocumentBuilderFactory classes. Create manifest file which imports the packages org.w3c.dom, org.xml.sax, and javax.xml.parsers. Add a Bundle-Activator header to the manifest pointing to the XMLParserActivator, the sub-class that was created, or a fully custom one. If the parsers support attributes, properties, or features that should be registered as properties so they can be searched, extend the XMLParserActivator class and override setSAXProperties(javax.xml.parsers.SAXParserFactory,Hashtable) and setDOMProperties(javax.xml.parsers.DocumentBuilderFactory,Hashtable). Ensure that custom properties are put into the Hashtable object. JAXP does not provide a way for XMLParserActivator to query the parser to find out what properties were added. Bundles that extend the XMLParserActivator class must call the original methods via super to correctly initialize the XML Parser Service properties. Compile this class into the bundle. Install the new XML Parser Service bundle. Ensure that the org.osgi.util.xml.XMLParserActivator class is contained in the bundle. A single bundle should export the JAXP, SAX, and DOM APIs. The version of contained packages must be appropriately labeled. JAXP 1.1 or later is required which references SAX 2 and DOM 2. See  JAXP for the exact version dependencies. This specification is related to related packages as defined in the JAXP 1.1 document. The following table contains the expected minimum versions. The Xerces project from the Apache group,  Xerces 2 Java Parser, contains a number libraries that implement the necessary APIs. These libraries can be wrapped in a bundle to provide the relevant packages. A centralized XML parser is likely to see sensitive information from other bundles. Provisioning an XML parser should therefore be limited to trusted bundles. This security can be achieved by providing ServicePermission[javax.xml.parsers.DocumentBuilderFactory | javax.xml.parsers.SAXFactory,REGISTER] to only trusted bundles. Using an XML parser is a common function, and ServicePermission[javax.xml.parsers.DOMParserFactory | javax.xml.parsers.SAXFactory, GET] should not be restricted. The XML parser bundle will need FilePermission[<<ALL FILES>>,READ] for parsing of files because it is not known beforehand where those files will be located. This requirement further implies that the XML parser is a system bundle that must be fully trusted. XMLParserActivator - A BundleActivator class that allows any JAXP compliant XML Parser to register itself as an OSGi parser service. 702.9.2.1 public static final String DOMCLASSFILE = "/META-INF/services/javax.xml.parsers.DocumentBuilderFactory"
702.9.2.2 public static final String DOMFACTORYNAME = "javax.xml.parsers.DocumentBuilderFactory"
702.9.2.3 public static final String PARSER_NAMESPACEAWARE = "parser.namespaceAware"
702.9.2.4 public static final String PARSER_VALIDATING = "parser.validating"
702.9.2.5 public static final String SAXCLASSFILE = "/META-INF/services/javax.xml.parsers.SAXParserFactory"
702.9.2.6 public static final String SAXFACTORYNAME = "javax.xml.parsers.SAXParserFactory"
bundle The bundle using the service. registration The ServiceRegistration object for the service. □ Creates a new XML Parser Factory object. props - Hashtable of service properties. context The execution context of the bundle being started. □ Called when this bundle is started so the Framework can perform the bundle-specific activities necessary to start this bundle. This method can be used to register services or to allocate any resources that this bundle needs. Throws Exception– If this method throws an exception, this bundle is marked as stopped and the Framework will remove this bundle's listeners, unregister all services registered by this bundle, and release all services used by this bundle. context The execution context of the bundle being stopped. □ This method has nothing to do as all active service registrations will automatically get unregistered when the bundle stops. Throws Exception– If this method throws an exception, the bundle is still marked as stopped, and the Framework will remove the bundle's listeners, unregister all services registered by the bundle, and release all services used by the bundle. bundle The bundle releasing the service. service The XML Parser Factory object returned by a previous call to the getService method. □ Releases a XML Parser Factory object.